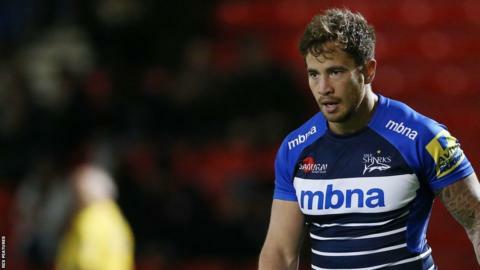 Sale Sharks boss Steve Diamond says that no one can replace what fly-half Danny Cipriani offered the club. The 28-year-old agreed a deal to rejoin former club Wasps from the 2016-17 campaign after four seasons with Sale. "I don't think anybody can emulate what Cips can do in his maverick mind, that's why he's so fantastic," Diamond told BBC Radio Manchester. "Unfortunately we've not got anybody ready in the academy, so the first port of call will be to look in England." Cipriani, who has been capped 14 times by England but was omitted from their 2016 Six Nations squad, will remain with Sale until the end of the season. "It's not really a divorce, it's just a separation really," continued director of rugby Diamond. "It's a cycle that happens. You don't get too attached and you don't build your team round one man, you'll see what we've got every week. "The surprising thing for me is that he's gone to Wasps with the fact that they've got [Jimmy] Gopperth, they've got [Ruaridh] Jackson there already. "To play for England, if that's your ambition, you've got to be playing every week and I'm not sure that'll happen for him there." Cipriani, who had been linked with a summer move to Toulon, was approached by the French Top 14 side earlier this year but Diamond says Sale would not approve his early release. "I thought a couple of weeks ago he'd decided to stay," said Diamond. "He had an offer for Toulon to take him this year only but obviously we were never going to release him for that."